Billie Holiday began performing ‘Strange Fruit’, the anti-lynching song written by Abel Meeropol (under the pen-name “Lewis Allan”), in 1939. It was, as David Margolick notes, a difficult song to categorize at the time: “too artsy to be folk music, too explicitly political and polemical to be jazz”. Although jazz would come to be seen as a vital medium for the expression of discontent by the time Nina Simone came to record Meeropol’s song, this was not the case in 1939. Dorian Lynskey identifies the newness and strangeness of ‘Strange Fruit’ in the way it alienated audiences rather than inviting complicity or solidarity as contemporaneous propaganda songs tended to. Rather than aiming for collaboration, “the music, stealthy, half in shadow, incarnated the horror described in the lyric” (Lysnkey). Nightclubs were dirty, making records was dirty, popular music was dirty and to mix all that with politics seemed senseless and demeaning. And until songs like ‘Mississippi Goddam’ just burst out of me I had musical problems as well: how can you take the memory of a man like Medgar Evers and reduce all that he was to three and a half minutes and a simple tune? That was the musical side of it I shied away from; I didn’t like “protest music” because a lot of it was so simple and unimaginative it stripped the dignity away from the people it was trying to celebrate. Simone’s attitude changed as she began to compose her own protest material and to politicize that of others. Like Holiday, she would take protest material into the supper clubs and, like Meeropol and Holiday, she would make it art. Janell Hobson, like Lynskey, notes Holiday’s ability to avoid the potential pathos of ‘Strange Fruit’ and to avoid sentimentality through the use of ironic distance. Meeropol’s words, for Hobson, fetishize the black body, which is “rendered metaphorically, even romantically, as ‘strange fruit hanging from the poplar trees'”. Holiday’s vocal “bring[s] alive the poem’s ironic edge by invoking the cynicism and despair that elevated the song from sentimentality to poignancy”. This is achieved through moments such as Holiday’s “sour” delivery of the word “bitter” and “the long, drawn-out off-key intonation of the word crop”. For her part, Simone moves between Holiday’s ironic stillness and a more anguished cry. She offers a solo piano reading with little of the mercury virtuosity of many of her recitals, opting instead for slow-moving chords over which she stretches her voice, quiet at first, rising in volume at the mention of “black bodies swinging in the southern breeze”, then dropping again. As the song progresses, she moves through sadness, poignancy and horror, the latter articulated via the shadow of her grainy breath, which is audible at certain points. At no point does she sound sentimental, although she manages this avoidance in a manner distinct from Holiday’s. Where Holiday had adopted a distracted, flat and ironic (“sour”) tone, one which meant that the potentially “voyeuristic” lines were granted an almost Brechtian alienation, Simone’s is a more chiaroscuro reading, its light and dark textures unfolding the grim tale in the manner of a film noir. In the latter stages of the song, Simone starts to stretch the words to ever greater lengths, spending ten startling seconds on the word “leaves” (2:24-34). She saves the greatest amount of articulation for the final “crop”, substituting Holiday’s inquisitive articulation of the word for four swiftly traversed notes. 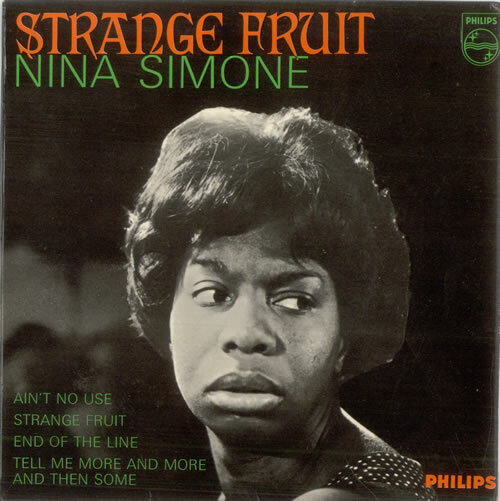 Simone’s rendition of ‘Strange Fruit’, with its shift between flatness and depth of field, provides further evidence that, for her, blankness and the neutral tone were part of a wider set of performance dynamics that also included the sass of Bessie Smith and Ma Rainey and the controlled vulnerability (or vulnerable control) of Ella Fitzgerald, Sarah Vaughan and Maria Callas. Perhaps one of the reasons she insisted on identifying with Callas rather than Holiday was a recognition of the multiplicity of roles she could and would play, not only within a concert performance, but even within one song. This entry was posted on June 2, 2013 at 5:02 pm and is filed under Politics with tags Billie Holiday, distance, protest songs, role playing, ugliness. You can follow any responses to this entry through the RSS 2.0 feed. You can leave a response, or trackback from your own site.